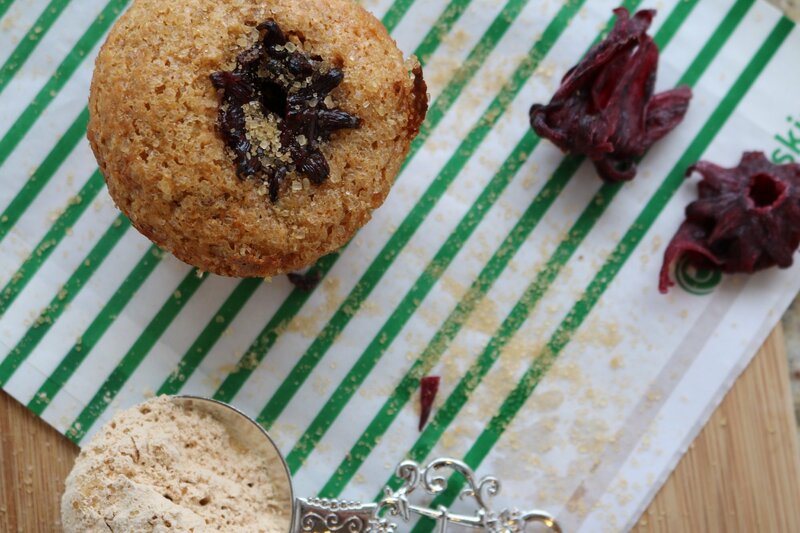 Banana muffins you've probably heard of, but baobab might have made you scratch your head. For those who have yet to try this African Fruit let me introduce you to this superfood. Baobab is a rich source of Vitamin C which means it is a potent immune system booster. The Vitamin C in Baobab also contributes to healthy looking skin. Because Vitamin C improves the absorption of iron, it is also beneficial for those who are anemic. Baobab is also highly alkaline which can help balance the body's pH balance. Bonus!! The high fiber content of Baobab means that it will slow down the release of sugars into the blood stream and it is also excellent for digestion. The soluble fiber in Baobab makes it a prebiotic which is the fertilizer for probiotics! This prebiotic in Baobab also contributes to a good night's sleep, so eating some is part of a good sleep hygiene routine! 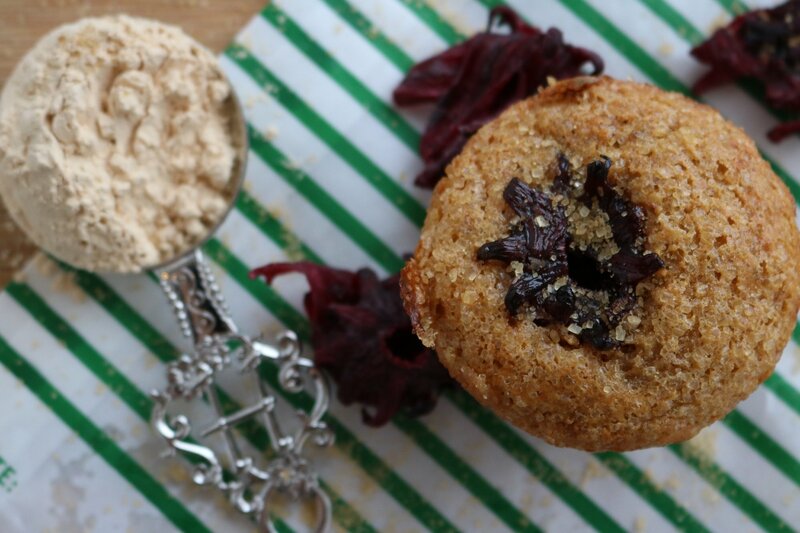 In this recipe, I am using Baobab powder which is made from the dried pulp fiber of the Baobab fruit. 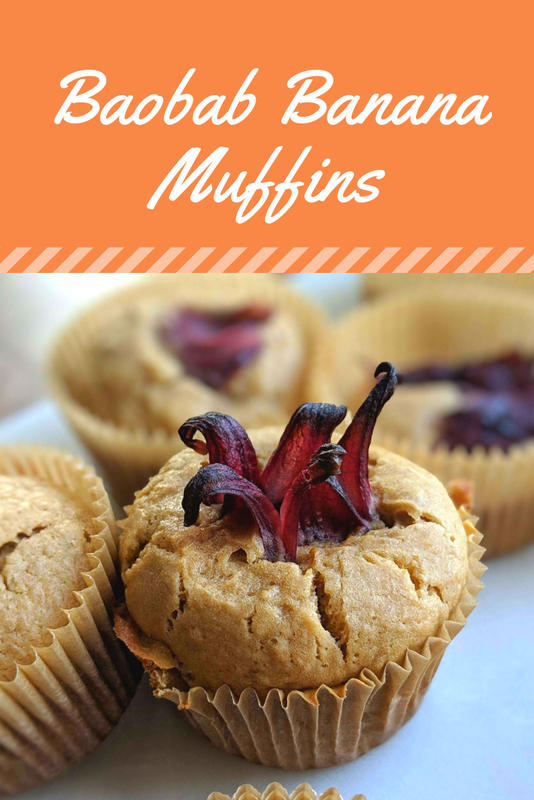 I was tempted to call these “Balboa Muffins” for my friend and Jubilee Road co-host, Jami, because that's what she called Baobab when I mentioned it in our podcast. Couldn't give her too much of a hard time since I also mispronounced it for a while as well. Personally, I prefer to mispronounce it. I say BOW-bab (sounds Chinese) but “they say” it's BAY-o-bab. Whatever you call it, Baobab is a superfood that will help you power up your health. Here's the Baobab that I've been using in this recipe. My Dried Hibiscus Flowers came from Trader Joe's but don't worry if you don't live near a TJ store. You can also purchase dried hibiscus online here. 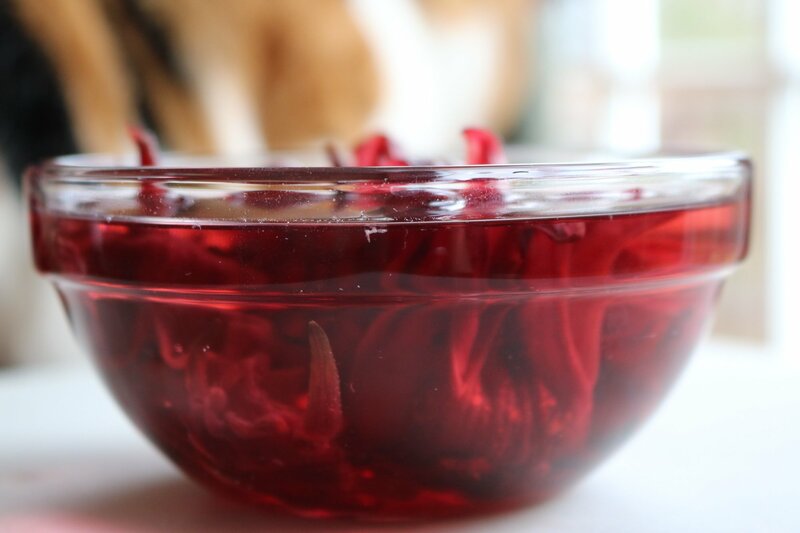 If you don't want to bother with soaking the dried hibiscus flowers, just snip them up in small pieces with some kitchen scissors. The soaked ones are easier to bite into because dried fruit tends to be a bit chewy. Mix bananas in a mixer till creamy. 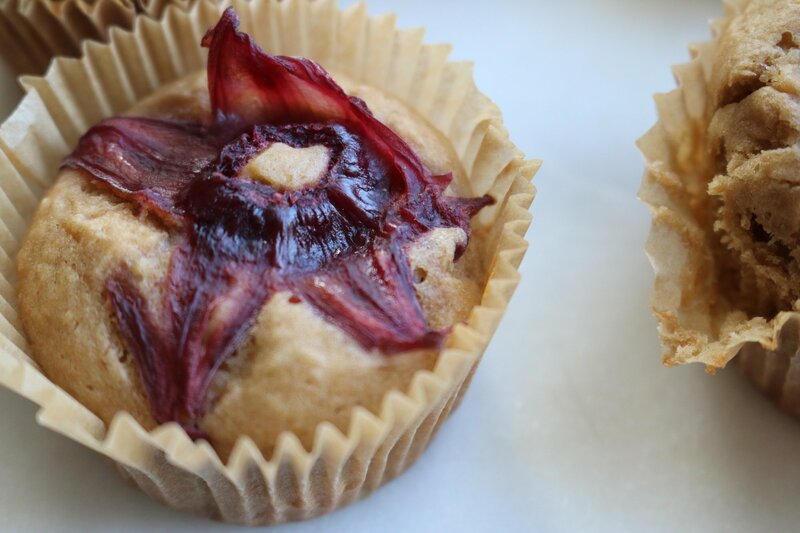 If you prefer gluten-free, I have made these with both the Trader Joe's gluten free baking mix as well as Bob's Red Mill 1 to 1 Gluten Free Flour. Hibiscus can be beneficial for lowering high blood pressure and high cholesterol, as well as improving digestive, immune system, and inflammatory problems. It can help to remedy liver disease and reduces the risk of cancer. Hibiscus can also speed up metabolism and aid weight loss. Hibiscus is rich in vitamin C, minerals and various antioxidants. 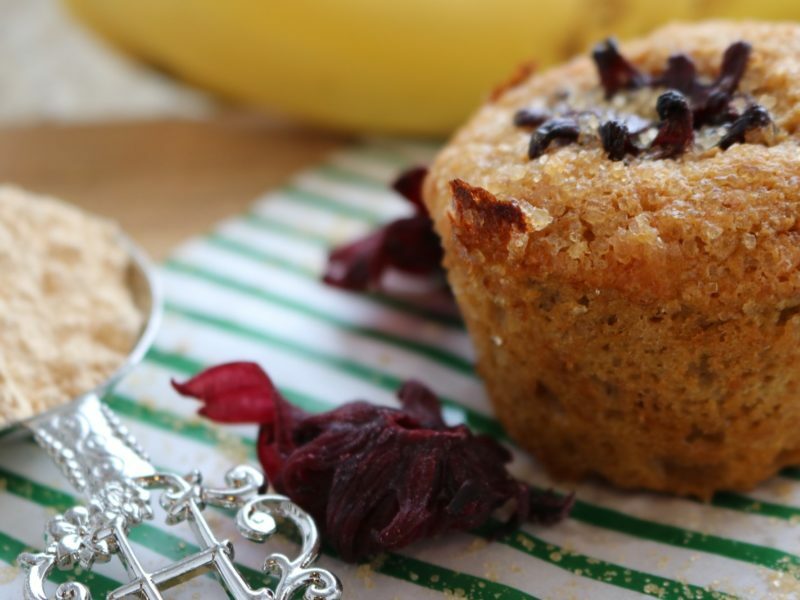 With the combination of Vitamin C rich Baobab and Hibiscus, the potassium rich bananas, and high fiber count, these bananas are an excellent snack for kids and adults! 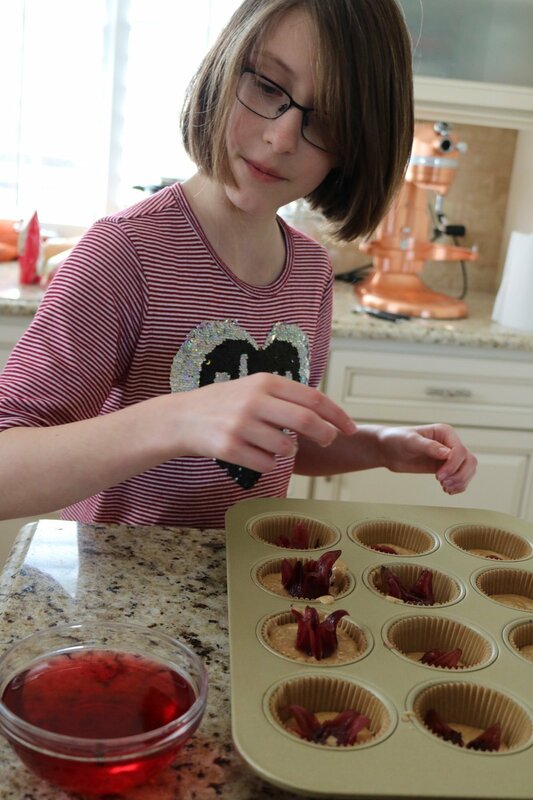 This is a beginner recipe, in fact my 10 year-old-daughter made the muffins in some of these photos. Let's start baking! Don't forget to pin this for later!